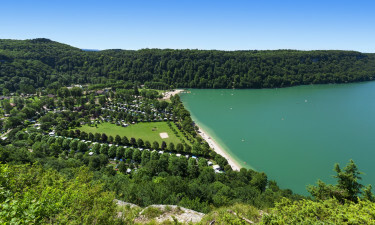 Domaine de Chalain Campsite is a luxury camping site that is set in the Jura region of France. This part of the country boasts the Alps as its backdrop and people who book luxury accommodation or a luxury bungalow tent here will be treated to plenty of fresh mountain air and stunning mountain views. This excellent site also offers guests a wide range of facilities and amenities, which makes this the perfect place to experience luxury camping. What Makes Domaine de Chalain Campsite So Special? The site is set right on the shore of the picturesque Lake Charlain and this makes the perfect setting to sit and soak up the scenery. Sailing and surfing are permitted on the lake and guests can hire all the equipment they need onsite, while there are also some excellent fishing sites here. 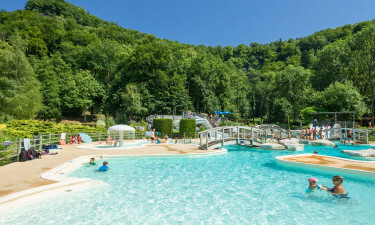 While the cool, clear water is ideal for swimming in, guests will also find a large outdoor swimming pool at Domaine de Chalain Campsite, which comes complete with a separate paddling pool for younger kids to make use of. Anyone looking to take a little time to relax during their camping holiday will love the onsite sauna. This is the perfect place to really indulge in pure relaxation and pampering, not to mention the fact there’s a wide range of spa treatments also available here. Families can have fun while they relax by playing games such as miniature golf on the special onsite course and table tennis. Cycling through the countryside is an excellent way to get a feel for the intense natural beauty of the area and there are several enchanting cycling trails to follow. Visitors who have plenty of stamina can cycle to the enchanting thermal baths, which are around 15 miles away, while there are also some lovely trails leading to nearby villages. Bicycles can be hired at the LUX-camp, making exploring the countryside very easy. 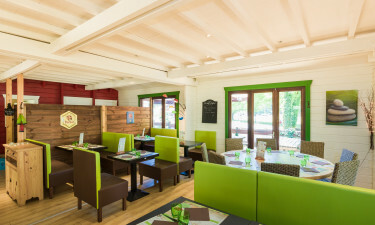 At the end of the day, guests are sure to love having an evening meal at Domaine de Chalain Campsite. You can either buy your groceries on the campsite to prepare your own meal, or have a meal from the take away.